The Jack Adler Collection Of DC Cover Art! Star Spangled War Stories #170 Original Four-Color Separation. CLASSIC WWII COVER STARRING THE LOSERS! Courtesy of the legendary talent JOE KUBERT! This includes SEVEN DIFFERENT VERSIONS OF THE COVER ART! Just a few samples are shown in scans below. The top version, with all the colors and the black lines, is a preliminary approval cover, and looks much like the actual comic-book’s front cover. A conversation piece of the highest order. This actual one-off item was reviewed by D. Comics in early 1973 to produce the front cover to a popular WWII-themed comic-book. This became the cover illustration for a classic Unknown Soldier issue of the ever-popular series! Joe Kubert, born in 1926, has had perhaps the most prolific and lengthy career in the comics industry, going back to his youth in the thirties, continuing through the entire Golden-Age, Silver-Age, Bronze-Age, and Copper-Age of comics, and still continuing to this day! But he is perhaps most fondly remembered for his timeless covers for the DC war comics, such as this. This gorgeous museum piece includes unique versions of the gripping war scene, as an American G. Summons his fellow soldiers over the cave, declaring it to be clear, but among the dead bodies it shows a HAND GRENADE THAT’S ABOUT TO DETONATE! The first page is a full-color proof with all the colors and the blacks, followed by the black and white. Version, which exists no place else but here, and in the original line art if that still exists! Extra fresh, bright, and glossy colors, and printed on superior paper, so they look more awesome than the famous comic cover they produced. In the 1970’s the comic-book publishers converted to the “3M” style (made of just four transparent acetate or mylar sheets) color separation process, which occured shortly after this one was made, and very few of these earlier thick paper “sep’s” still exist for DC covers, even from the renowned Adler find. Many of you have read about this significant find in C. We are secure packagers and prompt shippers so expect to be pleased. Jack Adler worked through all the major periods of the comics: Golden-Age, Silver-Age, and Bronze-Age. He even colored the plates for the very first golden-age comic, the landmark introduction of Superman, in Action Comics #1, when he was but a youth back in 1938! He continued his freelance work, including work for the comics and the fashion industry, and eventually became DC Comics’ premiere colorist, on staff from the early’50’s through the mid’80’s, and was head of the art department for much of his tenure. He graduated from high school at the age of fifteen, and quickly got a degree in fine art. He became proficient at sculpting, pencilling, inking, painting, and photography. He pioneered the washtone/graytone effect which became so popular on the DC “Big Five” war titles, with this particular series one of the hottest of alll! In addition, he inked hundreds of covers over several decades as well; such as dozens of G. Combat covers and the entire run of Sea Devils, for but a couple examples… You’ll also see his name on the front cover of Plop #18, which he did with Basil Wolverton! Moreover, he also developed the “3-D” process used on the Batman 3-D and Superman 3-D comics in 1953; –so we’re talking about a major contributor to DC history! During the summer of 2004, the living legend himself, Jack Adler, (thought by some to have passed away years ago), at the urgings of his kind family, made his very first public appearance, at the San Diego Comic-Con. He was honored Thursday afternoon at the popular convention with the Inkpot Award For Excellence for Outstanding Achievement In Comic Art, and a rousing standing ovation from the many onlookers at the panel of Golden-Age and Silver-Age Greats, hosted by Mark Evanier of course! Adler, other noteworthy members on the entertaining and informative panel were Tom Gill (RIP), plus Jacobson, Colan, Springer, Harrison, and Bolle. On Friday at the Comic Con, there was a one-on-one panel with just Mark Evanier and Jack Adler, titled “Spotlight On Jack Adler”, and many questions were answered for the crowd of audience members whom were kept entertained by the charismatic and respected living legend. It is amazing how many great names were hired on or got their start in the industry by him! He also explained how he invented the 3-D image technology popularly used in Viewmasters, but was unable to get the deserved patent, as the film itself had been patented, but not in a similar 3D format, so he got burned, as viewmaster was able to capitalize on his invention freely! Plus, the method that made integrating photo cover and line-drawn cover art easily into a single cover image was also pioneered by this influential innovator. The technology was supposed to be kept a secret, but was leaked immediately by a DC exec! Julius Shwartz had told him “don’t tell me about it, just do it”, and when it worked, it worked, and was immediately utilized, as the articulate and charming Adler related. As an accomplished photographer, he created covers using photographs he had taken of his own grandchildren, producing his own copies of Shazam #2 and #6, which were displayed on an overhead projector to the glee of many enthralled listeners! The picture of Captain Marvel, sitting reading to the innocent youths, was actually of Jack Adler reading to his grandkids. These same grandkids were present at the panel, and turned out to be pleasant, gracious, and kind adults. Moreover, he highly touted the art skills of good friends Neal Adams and Joe Kubert, relating entertaining stories, of course! He helped Kubert set up his now legendary School Of Comic Book Art. Once the school was set up in 1976, he was supposed to head the school, but had to back out, as he couldn’t bring himself to move to New Jersey. You could write a book on the contributions Mr. Adler has made to the medium many of us know and love. Back in the “good ole days”, DC normally burned or discarded such production art once the comic went to print. However, during the period of 1967 to 1974, (with some exceptions dating earlier/later), this award-winning artist pulled aside many prime examples of production art, representing each step of the comic-making process! Nevertheless, there’s an extremely small amount of these that were saved, considering the volume that was produced in those days. It is estimated that out of 840,000 pieces created for the production process over that time period, only about 3,700 or so survived, thanks to Jack Adler; A miniscule percentage of less than one half of one percent! This is the actual Four-Color Separation, (sometimes known as Progressive Color Plates), for the front cover of the fan-favorite war comic. The top layer (first page) is a brilliant glossy Approval Cover, which is much like the finished cover, but sometimes includes revisions and improvements, confirming its “work in progress” function in comics history. Then, the next page is black and white, aka: “Silver Proof” of just the black line art, with no colors whatsoever. Up next you get a version with just the colors, but no blacks at all. Then you get versions of just blue, one page of just reds and yellows, another has just red, etc. All total, you get SEVEN different versions of the comic’s front cover and spine area! The DC exec’s used this to fine-tune the art before the actual book went to print. Only one such piece was created per cover.. Then, years later, it changed hands again, with the vast bulk of the load still untouched… Eventually, after lengthy negotiations, a longtime friend and I were able to acquire the whole load (less the horror material) from the Southern California art collector who possessed this landmark find since 1997. I was able to obtain the horror genre after a few years of additional wrangling. A signed & embossed cardstock Certificate Of Authenticity is included, forever guaranteeing the provenance of each piece from this major historic discovery. Four-Color Separations to Silver-age & Early-Bronze DC Covers are exceedingly rare in the market, and very impressive, as they are incredibly bright and glossy, and contain unique variations seen no place else. This item is considerably larger than comic size. And the recent Alter Ego #56 has a great interview with Adler, and also enlightening interviews with a few of the major talents he influenced: Joe Kubert, Neal Adams, and Howard Stern. Lots of great reading and helpful info! I hope that the few low-resolution scans will convey that this is a great looking showpiece, which would be especially impressive with a few of one’s favorite versions in a grouping, framed on a wall or shelf. Regrettably, our scanner makes the colors look bland and the lines appear blurry, –when this museum piece is actually stunning. This irreplaceable item is just as rare as the blander black & white twice-up art… Fabulous eye-appeal: High-quality paper was used. Snow-white whites and super rich colors! This is a must-have piece for any fan of ultra-rare DC collectibles, or original art fanatics, or the pedigree comic & art collector, or the serious Kubert buff, or just the war ephemera fan or Jack Adler fan who enjoys owning true rarities to keep himself satisfied visually, while keeping his portfolio diversified in a most dramatic fashion! SATISFACTION GUARANTEED 14-day return privilege. KEY COMICS IS ALWAYS DEALING IN COMICS & ART! (’30’s to’70’s) Add keycomics to your Saved Sellers List if you collect back-issue comics or artwork! For more samples from our diverse inventory, including collectable Comic-books and Comic-Art, and CGC-Graded Comics, plus more DC COVER ART from the historic Jack Adler Collection that we listed in assorted categories, please see our other auctions. Good Luck and Happy Collecting! 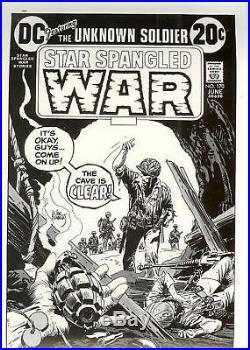 The item “PROGRESSIVE PROOF ART Star Spangled War Stories 170 FOUR-COLOR SEPARATION Kubert” is in sale since Saturday, June 05, 2010. This item is in the category “Collectibles\Comics\Original Comic Art\Other Original Comic Art”. The seller is “keycomics” and is located in Mesa, Arizona. This item can be shipped worldwide.